Many people love their dogs but, perhaps due to work commitments, there is not enough time in their day to give their pet the time and exercise that is so badly needed. This is where I come in. If you live-in the Finchley then we may l be the answer to your prayers! I offer a number of different dog walking and dog sitting services and one that you might be most interested in is the small group dog walking option that I carry out where required. Taking care of other people’s dogs is my passion and I give as much love and attention to every dog as I would do if the animal was my own. To this end I personalise the service to suit the client (and the dog of course!). This way I can guarantee that both dog and owner are satisfied with the level of service that I offer. While some dogs are best suited for solo dog walks, others are good at socialising with other dogs so, in these circumstances, I carefully place them in small groups for their walks in the Finchley area. I never forget that dogs are, essentially, pack animals and are most happy when running with other dogs. 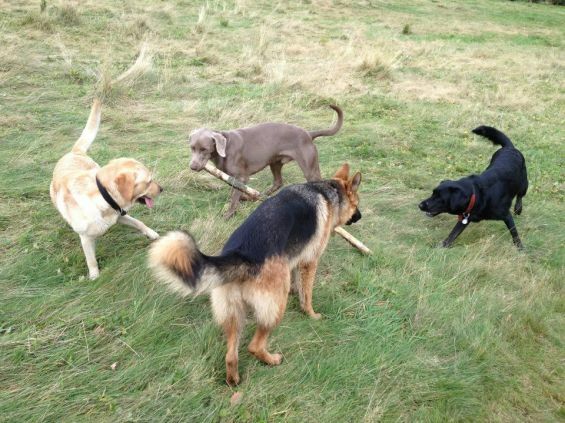 Owners need have no fear about this though – I wouldn’t want them to imagine that Finchley dog walker goes on walks with dozens of excitable, noisy dogs straining at the leash. This is definitely NOT how I look after my charges. My small group dog walking service consists of no more than two or three dogs at a time. I am very careful to only put dogs together that I am sure will get on weIl. There are two objects to this process – the dogs must get at least a full hour of good exercise and, even more than that, they must have fun! I will always ensure that I carry out my small group dog walking tasks in a safe area close by – somewhere in which they get the chance to run freely off the lead without any danger of my losing a single one of them. I feel that this service is most suitable for small to medium dogs and the main stipulation that I insist on is that they respond well to being called. I understand a dog’s natural curiosities when out playing but I also expect that they will come when I need them back on the leash.